Developed to maximize turbo-diesel efficiency, Quick-Turbo provides massive instantaneous torque. BigHead Wastegate delivers quick, controlled turbo boost. Banks developed the Quick-Turbo to eliminate sluggishness out of the hole and produce strong acceleration and lower EGTs. Quick-Turbo produces massive torque right from idle, achieves a higher peak faster, maintains more boost through the powerband, and doesn't over-boost. Banks' exclusive BigHead wastegate actuator prevents wastegate blow-open by keeping the valve seated at higher pressures, increasing mid-range torque and top-end power. 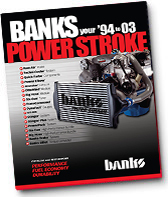 Banks corrects boost-level limits in late 1999.5-2003 models with a high-boost compressor wheel, built for higher boost levels without compromising turbo performance. Includes Quick-Turbo housing, Big-Head wastegate actuator, and Compressor Wheel. Here's the TEST REPORT for your vehicle!